Figure 1-22. Free Bolt Momentum for First 0.00234 Second. back principle. 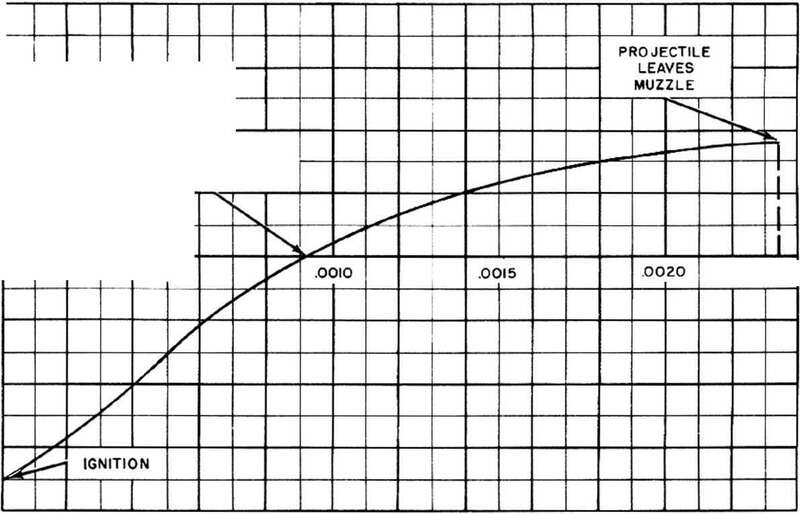 However, when comparing advanced primer ignition with plain blowback it must be emphasized that the advantages gained by making use of the momentum of the returning bolt are somewhat limited when this factor alone is considered. With all other things being equal, these advantages are as follows: First, the weight of the recoiling parts in an advanced primer ignition gun can be less than half of that in a plain blowback gun. 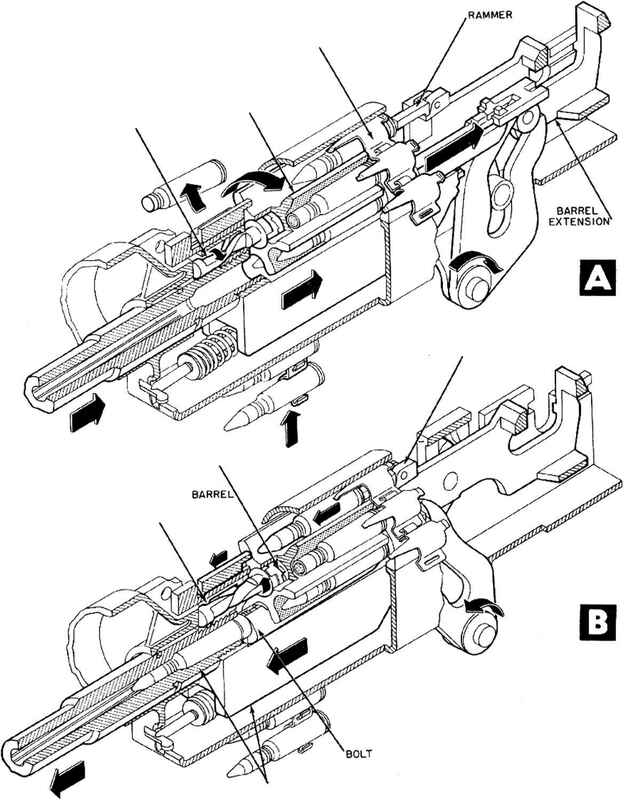 Second, slightly higher boll velocities are allowable in an advanced primer ignition gun and therefore a somewhat greater rate of fire can be attained than with plain blowback. It should be realized that these advantages alone are not sufficient to permit the design of a practical gun employing conventional ammunition. Reasonable performance can be obtained only by using ammunition with the special base form previously described. Of course, if this ammunition were used in a plain blowback gun, the bolt weight could be considerably reduced and a higher rate of fire could be obtained but the weight would still be too great and the cyclic rate would still be too low for the design to be practical. The use of advanced primer ignition, however, further reduces the bolt weight and further increases the rate of fire to the point where a practical design can be achieved. data used for plain blowback arc available. (See figs. 1-9, 1-10, and 1-11.) Since many of the methods and formulas employed in this analysis arc the same or are very similar to those used for plain blowback, the derivations of the formulas and the explanation of the procedures will not be repeated here. However, as they arise, any new concepts or new formulas will be explained.